Visualization can be as simple or complex as the information you need to memorize. 1. Make a mental picture: If you want to remember a vocabulary word or a concept, drawing a picture on a piece of paper can help you make a visual memory. For example. if you want to recall that a tomato is a fruit, visualize a bowl of fruit with a tomato in it. For an upcoming test, draw a picture that helps you visualize each concept or vocabulary word to be learned. Then, look at the your study guide and for each word or concept that needs to be remembered, try to call up the picture that you drew in your mind. If you can't, go back and look at your drawing again. 2. Make a cartoon. If you want to remember more complicated concepts, such as the life cycle of a moth, draw a cartoon with a frame for each stage in the lifecycle; now put the cartoon drawing away, and visually recall each cartoon frame, moving from egg, to caterpillar, etc. When you study each day, start by trying to re-draw the cartoon. Refer back to the original drawing if necessary. By the end of several days, the cartoon will be firmly drawn "in your head!" 3. Add words to the cartoons. If you need to recall even more complicated concepts- such as one might find in an advanced botany class, you can label the frames of the cartoon with words; now when you put the physical drawing away, you can visually read the captions. Why is it so easy to remember song lyrics? Even when they don't make sense!? Music helps our brains encode memories easily. 1. If you need to learn a long list of vocabulary words, or state capitals, or multiplication tables, nothing works better than putting it to music. First find a tune you like, then write out the new "lyrics" on a piece of paper ("4x4=16! 4x5=20!" or "Sacramento is the capital of California!" Then start singing. If you have forgotten a chorus, refer back to your song sheet. Here is a very cool memory technique that is good for middle school students and older. It's called the method of loci and it dates back to the middle ages. The idea is to have a room in your mind where you "keep" information for tests. It can be your bedroom, your kitchen, or in a building that you make up just for this memory strategy. They key is that it always needs to be the same place. 1. In the room, identify several cabinets, boxes, or shelves where you can store information. 3. Practice walking through your memory room several times, opening up the storage points, in order. It is a good idea to draw the room and the storage places. 4. Now you are ready to store information! Take a list of information to be memorized. Lets say, formulas for your upcoming algebra test. Take the first formula, visualize yourself placing it in the first storage area- like the top drawer of your dresser. Now place the second formula in the next storage area. Its a good idea to draw the formulas in the storage areas. 5. Right away, "walk through" your room again, looking in each storage place, and "seeing" formula. This is how you will retrieve the information. 6. Each time you study the test material, walk through the room and open each drawer, identifying the information stored in each. That way, when you sit down for the test itself, you will just need to take a walk through your memory room. Good old flash cards- yes, they really work. Making a flash card is much better than just looking over a list of information to be learned, because when we take the time to write out the word on one side of the card and it's definition on the other side, the information is being actively encoded in our brains. It's also an efficient way to learn new information, because we can constantly whittle away at the pile of cards we haven't yet learned, and put the card we have learned in "done" pile. We don't need to waste time looking at facts we already know. Try testing yourself immediately after writing the flash cards out. Make two piles, one "need to learn" and one "already learned. Each time you get one right, put it on the "already learned pile." Now you have a good sense of how much you need to learn. Hopefully the "need to learn" pile isn't too big. 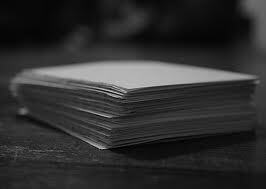 Divide the cards in the need to learn pile into two or three smaller piles, and make it a goal to learn one pile a night. Make sure you periodically go through the "already learned" pile so that you can reassure yourself that you really do know them. Its even more effective to draw a picture on one side of the card to illustrate the idea you are trying to memorize. For example, if you want to remember the Spanish vocabulary word "gato", you can draw a cat on one side of the card, and the word "gato" on the other. Drawing is an active way to encode information in your memory system. The visual image will also help you recall the word more efficiently. if you want to recall a story- don't just read it over and over again- that is a rehearsal technique and so boring you are likely to go on autopilot and get little out of it. Instead, retell the story. 1. Next time you read a short story, when you are finished, retell it in your own words- better yet, retell it to a study partner, or your parent. 2. If you are trying to study for a test in an English class on an entire book, make sure you stop at the end of each chapter and retell the story. 3.Take notes on your own re-telling. Couldn't recall some important information? Go back and re-read/ scan for that info, and insert it into your own re-told summary. When you study for the test, re-tell the whole thing again, and then check your notes to make sure you didn't forget any information.